ATLANTA, March 22, 2018 /PRNewswire/ -- When consumers need loans for auto purchases, understanding their own credit risk situation matters. In its latest consumer automotive survey, Equifax Inc. (NYSE: EFX), a global information solutions company, analyzed automotive shopping and buying behaviors across prime and subprime credit buyers, as well as Millennial and Baby Boomer age groups. 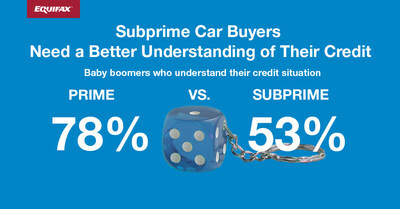 Among the key takeaways from the survey, prime and subprime Millennials expect to spend the same amount on their vehicles; and subprime Millennials say they are more aware of their credit situation compared with subprime Baby Boomers. "Online resources available today have helped Millennials become more educated and savvy shoppers along with their Boomer counterparts," said Rebecca Kritzman, Senior Director, Automotive Marketing at Equifax. "Even though the Internet has provided many of these educational resources, we believe auto dealers and lenders can play an even bigger role in helping to guide and advise these customers before and during each transaction. A larger emphasis here can help customers avoid defaults in their loan, thus increasing the number of shoppers that return for repeat purchases in the future." Additionally, subprime and prime Millennials place a higher value on input from their family and friends when seeking advice on affordability before obtaining a loan versus Boomers. 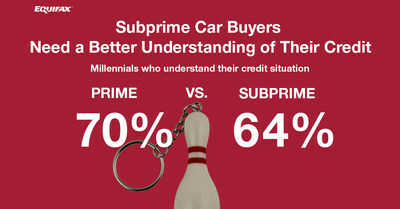 However, subprime Millennials (11%) are much less likely to rely on banks and credit unions versus prime Millennials (25%) when seeking input on vehicle affordability. 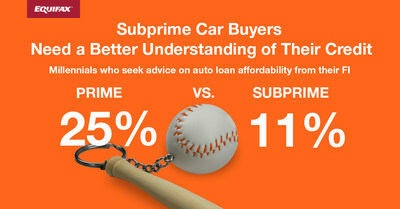 Considering the number of "underbanked" individuals that fall into this subprime category, dealers should again look at this trend as an opportunity to help advise on the realistic price point for purchase given their overall financial picture and look at educating influencers as well.